There are many temporary corporate housing providers on the market, but not all of them are worth your precious time and money. If you’re going to commit yourself to a short term rental, how can you be sure you’re choosing the right company? We’ve created this blog to help you understand what to look for in a temporary corporate housing provider. This is an easy way to check if the company is credible and trustworthy. There are associations that govern this industry, and provide accreditation to the companies that have met the standards that they have outlined. 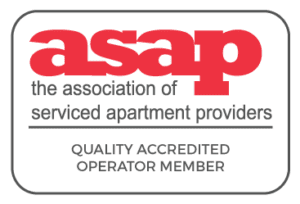 Some of these associations include the Association of Serviced Apartment Providers (ASAP), Corporate Housing Providers Association (CHPA), and Leadership for Workforce Mobility (CERC). City Gate Suites is a proud member of all these of the mentioned associations. A friendly voice on the other end of the phone is crucial to running a good business, and we here at City Gate Suites are well aware of that! It is important for you to feel comfortable with the people you’re doing business with, and we want to make your stay feel as comfortable as possible. When looking for temporary corporate housing, you are likely committing to doing business with the service provider for several months, so you want to make sure that they will provide you with good customer service. At City Gate Suites we are always happy to connect with our guests and address any issues they may be facing. If you have no prior experience with a company then it’s hard to know the quality of their service for certain. A good thing to make you feel more confident is looking at the statements of past guest. Many companies will have testimonials listed on their company website, Google+ account, and Facebook page. This will give you a good indication of what their past customers thought about their service.